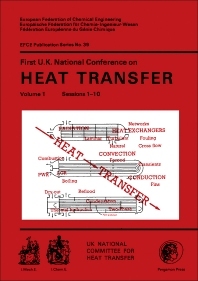 First U.K. National Conference on Heat Transfer, Volume 1, documents the proceedings of the conference organized by the U.K. National Committee for Heat Transfer—a joint committee of the Institutions of Chemical and Mechanical Engineers and includes a member nominated by the Heat Transfer Society—held at the University of Leeds, on 3-5 July 1984. It is intended that the Leeds conference will be the first of a series of UK National Conferences which will be held at four-yearly intervals (1984, 1988, 1992 etc). Thus, for people working in the heat transfer field there will be an opportunity to present and discuss their work at a major conference every two years. This volume contains 55 papers that are presented during Sessions 1-10. The papers in Session 1 deal with post dry-out and drop heat transfer. Session 2 presents studies on the thermal hydraulic aspects of accidents and transients. Session 3 contains papers on the thermal hydraulics of reflood. Session 4 focuses on reactor operational heat transfer while Session 5 deals with AGR and other fuel heat transfer. The presentations in Session 6 cover fouling mechanisms while those in Session 7 focus on fouling detection, inhibition, and control. Session 8 takes up heat transfer in regenerators and fixed beds. Session 9 discusses papers on heat exchange networks. Session 10 contains studies on condensation and condensers. 1.4 The Langmuir coefficient for heat and mass transfer for a drop in super-heated vapor with inert gas and fog present.